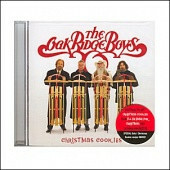 Just in time for the Holidays comes an all new Christmas CD by the Oak Ridge Boys! "Christmas Cookies" has 14 tracks of some of your favorite traditional Christmas songs plus the hit and the album title "Christmas Cookies." Also included in the CD is a Christmas cookie recipe for all to enjoy!